Everyday we get contacted by American Gun Safe Owners who seek to upgrade their Fireproof Gun Safes. Usually these folks are calling because their firearms collection somehow got way bigger than what they had anticipated when first thinking of what size gun safe they would need for the future. This is a common theme heard over and over again with gun safe owners from every town in the U.S.A. This poses a secondary problem. What’s my old gun safe worth today? As long as people own guns there will be a need for a place to store them. In fact, people may not completely rely on the law for the safeguard of their interests and lives and as a result all have got the right to own guns, irrespective of gender and social status. But these firearms need to be locked in a secured safe so that these can remain beyond the reach of thieves, children and other unauthorized people soundly in a Gun Safe. Keeping firearms protected from unauthorized use is the prime responsibility that every gun owner needs to take. Helping gun owners in achieving their goals, Old Glory Safe, a premier manufacturer and supplier of gun safes, has introduced BR “Battle Ready” Gun Safes in the American market to allow gun owners to store their firearms and ammunitions inside them. Welcome to Old Glory Gun Safe Company! Our team is proud to announce that we're now open for business, and we look forward to serving you all in the future. If you have any questions about this store or the New or Used Safes & Gun Safes found within, please don't hesitate to contact us any time. Our website has been carefully designed to provide you with Premium Safes & Gun Safes at affordable prices including an amazingly flexible online shopping experience, and its ease of navigation is something we think you'll grow to depend on and appreciate. Feel free to browse our entire Gun Safe catalog, and let us know if you have any questions, comments or concerns about the Gun Safes housed within. Our team is always ready and willing to assist our customers, and we are happy for your visit. 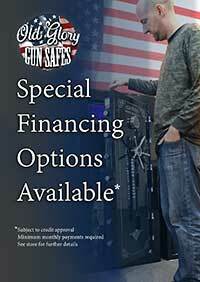 Give us a call as we love to talk about gun safes.